Introduction: The game of darts is played all over the world as a past time and also as a professional sport. Darts has been around for over a century but has gained a lot of popularity during the last decade due to the amount of television coverage that the game has received. It is very popular in the United Kingdom, Scandinavian countries, Germany and the United States. The World Darts Federation is the international governing body for the sport and the darts world rankings rate the best dart players in the world. Dart competitions take place on a regular basis throughout the world and events are held for both men and women. 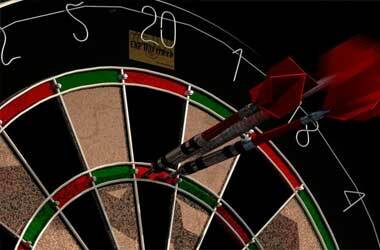 There are also dart team sports such as the Darts World Cup and the PDC World Cup of Darts. The top 3 dart players in the world for the men’s division currently are Michael van Gerwen, Gary Anderson and Peter Wright while the top 3 dart players for the women’s division are Aileen de Graaf, Deta Hedman and Anastasia Dobromyslova. Canada Betting: There is a niche market segment in Canada who follow both domestic as well as international dart competitions and love to wager on them. Some of the popular sports betting websites that offer wagers on darts include 888 Sports, Betfair, William Hill, Bet365 and Paddy Power. These sports betting websites offer online sports betting and also mobile app betting to enable bettors to wager on the go. These mobile sports betting apps are compatible with iOS and Android platforms. Some of the different wagers on dart betting include Most 180s, Total 180s, First 180, 9 darts special, 9 darts finish, Most 180s and Lose Match, Most 180s and Win Match, 170 checkout, 170 checkout specials, highest checkout score, total sets and correct score. These sports betting websites cover dart competitions for men and women. Some of the popular darts tournaments featured on these sports betting websites include BDO World Darts Championship, PDC World Championship, BDO Women’s World Championship and Premier League Darts. Darts in Canada: The National Darts Federation of Canada is the governing body for all Canadian darts competitions. Some of the top darts tournaments in Canada include Quebec Open, Quebec Winter Classic, Drummondville, St. John’s, K-W Tri City Open and Newfoundland. The top 3 Canadian dart players in the men’s division are currently Jeff Smith, David Cameron and Shawn Burt while the top 3 dart players in the women’s division are Trish Grzeskik, Joanne Luke and Patricia Farrell. You might have to sign up with more than one sports betting website if the one you select has limited coverage of dart competitions. You will get plenty of entertainment when you not only watch Darts matches and Darts Tournaments but also place a few little wagers on any up and coming Darts fixture, and in our Darts Betting Guide below you will find additional information such as where to place your Darts bets along with information on the many different types of wagers you can place. So if Darts is one of your favourite sports then do keep on reading for a few pointers in regards to how you can get the best value from placing Darts bets at any of our showcased online betting sites. Are there any special Betting Rules? Should I Make Live Darts Bets? What are the Best Dart Bets I Can Make? What Factors Should Influence my Bets? There are, on an ongoing basis, plenty of regularly held Darts Tournaments, these are held all over the world, as Darts is not just associated with the UK as many people may think. This guarantees that if you do have an interest in these kinds of sporting events then there are no shortages of up and coming tournaments for you to not only watch but also you can bet on any player you think will make it to the final or win any single match. Two very popular Darts betting events are the PDC World Championship and the Sydney Masters to name but two of them, and should you fancy putting our money down and placing a Darts wager, then below you will find the betting sites who can be guaranteed to give you a range of betting opportunities. If you have no experience of betting on Darts, then this particular sport comes with plenty of different wagering opportunities, for example you are able to place a single wager on which player you think is going to win each round of betting or the player you think is going to win or be placed at the final game of any Darts Tournament. Not only are the above mentioned betting opportunities on offer, but you can also place several unique types of wagers, such as which player is going to score 180 during any three dart throw and there are also plenty of each way or place types of wagers on offer. As such with plenty of wagering opportunities on offer should you fancy getting involved in Darts betting, which many sports bettors enjoy, then checkout our range of betting sites listed below we guarantee that each site listed is going to give you the biggest range of Darts betting options. We have handpicked each and every single sports betting site listed below, as we know that they not only offer plenty of value for money wagering opportunities on the game of Darts, but for added extras such as free bets, each one of them can be relied on to deliver the goods! Bet365 – Although darts isn’t the most energetic of sports, it is still one of the most exciting, even more so when Bet345 are offering you a 100% match bonus bet. This means you’ll be able to get on the oche the minute you sign up and deposit funds in to your account. Throughout the year, you’ll also receive a variety of offers and bonuses while also finding that you can withdraw at any time and see the money land in your account without delay. Ladbrokes – If you’re unsure on placing a bet on the darts, then take a look at Ladbrokes, not only do they explain everything in real English, their website is also laid out so you don’t need a PhD in computer science to browse. The newly launched newcomer’s bonus of up to C$120 free bets also ensures that you get the most out of your session at Ladbrokes. If you like the idea of having your playing sessions extended, make sure you take a look! Paddy Power – The first rule of business is to not give anything away. Paddy Power on the other hand are doing quite the opposite, and giving all new players a bonus 50C$ free bet when they join and deposit into their account. Because Paddy Power don’t do things by half, you’ll find that you can withdraw in double time, and the money you do withdraw from your bookie account will be available in your chosen account rapidly. Paddy Power also offer a faster payments type system, which is a service offered by most banks, meaning that payments can be processed and credited in a matter of hours, not days which used to be the case. Betdaq – We can highly recommend the Betdaq betting exchange should you be looking to take a slightly different look at the way you place Darts wagers online, For they let you not only bet on who you think is going to win any Darts match, but you can lay wagers also, and that simply means you can place bets on who you think is going to lose a Darts match as opposed to winning a match! With a CAD200 in free bets currently on offer then you really should check out what they have to offer and sign up today! Whilst all of the Darts bonus bets and free bonus offers listed above were valid when we put together this Darts Betting Guide, they are all subject to change and enhancements, and as such to make sure you know what offer is still valid and any that may have changed please visit the betting sites individually as that is where their current new player and ongoing bonus offers and free Darts betting opportunities can be found fully listed. Darts is not the most complicated of sports nor a team effort, which is why most betting sites don’t have too many rules about it. The most important fine print to remember is the one about player injuries or incapacities, which makes all bets void should a player is in any way enable to compete. Postponements are another thing, the rules of which vary between different sites. Darts is one of the most dynamic live bet options, especially since player performances can vary widely. Backing up the underdog can turn into a good profit in the course of minutes, making it vital to stay on your toes all the time. Another great thing about live bets is that the odds shift with the game. So, if the odds change for a player you are sure will make a return due to past performances and reputation of staying focused, you can use the momentum to score some nice gains. The best bets to make would be ones that you can make with some form of assurance, i.e. ones that you can back up, at least partially. Thus, bets like correct score, or total legs, are not your best option because they are difficult to predict. The simplest option for Canadian bettors would be the winner, or 1×2 bet, but this is also not the most profitable of options. On the other hand, future outright bets are a good way to exploit early odds if you are sure of your pick, as well as handicap bets, although they require a bit more skill. Knowing your players’ form is your best weapon for preparing for any upcoming event. With darts, even seasoned pros have been known to fail against newcomers who come up hungry for the title. Thus, head-to-head stats, player strengths, performance history in specific tournaments and recent injuries are all important, just like knowing the format and rules of the tournament you’re betting is. The number one event each year is the PDC World Darts Championship which is held once a year and is played by the most elite dart players. And once this event finishes, the next in line is the BDO World Darts Championship. Both events offer plenty of betting choices and diversity for any type of bettor, be it beginner or pro, as well as many resources to help you prepare. On the other hand, if you want to narrow your scope to top four in the world, you can bet on the Premier League of Darts, which is an event entered by four of the best dart players and four less known opponents. Between this and the World Matchplay, you can find almost every pro and up-comer worth knowing in the world of darts.